Pallet Collectors based in Reading, Berkshire provide wood recycling and wooden pallet recycling services. We can provide skip hire in Reading and wood clearance for any size or quantity of clean or processed wood from commercial premises or construction sites. Our range of large wood skips and roll on/off containers are available to be positioned on your premises for convenient wood disposal, ready for scheduled or adhoc collection and recycling. All of our services are competitively priced and provide all relevant waste transfer notes on collection or when invoiced. Our cost effective and ethical wood collection service provides a sustainable disposal and recycling service for organisations in Reading, Wokingham, Bracknell, Newbury, Basingstoke, Maidenhead and Slough. Pallet Collectors is in the business of wood and pallet disposal in an environmentally friendly way. Many businesses, warehouses and constructions sites have frequent amounts of wood or pallets for disposal and typically require pallet disposal and wood disposal to be managed separately to other waste stream due to the quantity, weight and volume. No matter what the condition, size or quantity of wooden pallets you have, Pallet Collectors will collect them. Most wood recycling company are picky when it comes to wood as they interested in the resale value. Pallet collectors collect for disposal, not for resale. Our pallet disposal process will mean that your wooden pallets will be recycled. 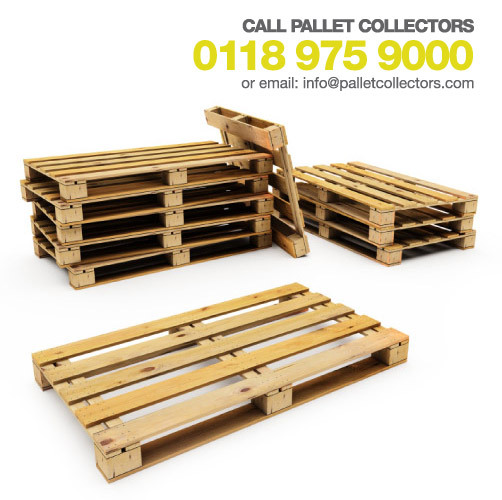 For a competitive wooden pallet recycling or wood recycling service please call Pallet Collectors on 0118 975 9000.